The clerks are alleged to have . We know this because the District Attorney took the odd step of filing 13,000 pages of evidence with the court within 3 days of the case being indicted. I erroneously guessed that this hearing was about a motion to change venue, but it was not. The attorney involved was truly asking the judge to ban the media from the case — a move that was obviously not granted by the court. 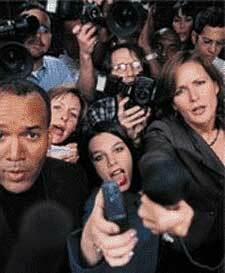 Judges do have the right to restrict attorneys involved in the case from speaking to the press, but of the press from reporting. A lot seemed to occur in today’s hearings. First, testimony was taken from all three reporters. Bill Baumbach arrived with his attorney and was asked about how many articles he wrote, and about his readership. He was also asked questions that he could not answer, in regards to whether or not he thought a fair jury panel could be found on the trial. As a reporter and not an attorney, obviously he had no clue. Ed Housewright came equipped with his own lawyer as well, presumably supplied by the DMN. His attorney objected to his even testifying, and brought a stack of caselaw to backup their position. Regardless of the objections, the judge required him to answer a couple of questions, but they were pretty simply and only about how many articles he wrote and about his readership. Danny Gallagher was also called to the stand and similarly testified his articles and readership — as far as he knew. All three reporters were questioned by Greg Davis, first assistant to the District Attorney as well. All three stated that their wish was to continue reporting on this case, as they always do with any case that they feel the public would care about. Bill Baumbach made a particularly interesting statement about how this case, above any, is most important to report on, considering this is a public corruption case, and the public has the right to know what is going on. The judge denied the motion to restrict the reporters from reporting. He similarly denied the motion to restrict the attorneys or witnesses from talking to the press. That statement to about 10 seconds, but his follow up took several minutes. He very plainly stated that he would not be pleased if they talked to the press, regardless of his denial of the motion. He asked that a "gentleman’s agreement" be reached between the State and the Defense to not talk to the press. The defense then brought up one of the underlying issues, the roundabout way of talking to the press through case filings. I was quoted earlier in the DMN as saying that the filing looked to me to be nothing more than a press release. Greg Davis from the DA’s office explained during the hearing that he always files all his discovery, so there might be a record of it to show what is turned over. While I don’t doubt that he files all discover sent to the defense, I feel quite comfortable that in the past 7 years at the office, the state has never filed a "notice of overt acts" within 3 days of a case being indicted. Much less a 13,000 page document. If someone wants to call me out on that, and show me another example, I’ll retract every word and stand corrected. But I doubt that will happen. It was agreed at the hearing that outside of business records (those must be filed with the court to be admissible), future discovery type documents will be shown to the court before filing. The next bombshell in the hearing came in regards to a potential trial date. The new DA will take over after January, and with administration change often comes a change in the assistant district attorneys. This can especially occur with the top positions, like those who would be trying a big public corruption case. Perhaps the defendants feel they will have a more sympathetic ear with an incoming District Attorney who was Cleared of all charges after being pursued by those who are trying this case. I guess this is a special case, with special treatment. You see, this was simply the first appearance on the case. In general, a normal criminal (felony case) gets about 3-4 settings before a decision is made of whether or not to go to trial or plea. I guess this special case circumvented that because the judge is already contemplating trial dates. I don’t doubt that a trial is where this case is headed, but it seems pretty unusual for that decision to be made on day one. ate that seems ludicrous to anyone who regularly practices complex criminal law. Especially in light of the discovery hearing that was announced would be on September 27. So here’s the scenario. Discovery hearing on September 27. State must turn over the discovery by ____ (whatever is ordered — 7 days? 10 days?). So that brings us to the first week of November. So then what, the attorneys get about a week to prepare for trial? All the attorneys on the case are respected local defense attorneys, many of which have thriving practices. It would be not only difficult, but almost impossible to prepare for a case of this magnitude in that short of a period of time. Whether or not the state is required to put in the charging document that the amount in controversy is being aggregated. If the defendants are planning on seeking severance. (If they want to try the cases separately instead of with all the co-defendants). I know I wouldn’t want to be in a trial with the "big fish" if I was the "little fish", nor vice-versa. Nor would I want some other attorney asking questions or saying things that hurt my case. If it is proper to plead this case with several counts on the indictment instead of returning several separate indictments.